In part I of our series on multi-factor authentication (MFA), we mentioned that the next topic would be securing access to AWS APIs with MFA. This week’s guest blogger Kai Zhao, Product Manager on our AWS Identity and Access Management (IAM) team, will give a brief overview of AWS MFA-protected API access. MFA-protected API access extends AWS MFA protection to AWS service APIs. 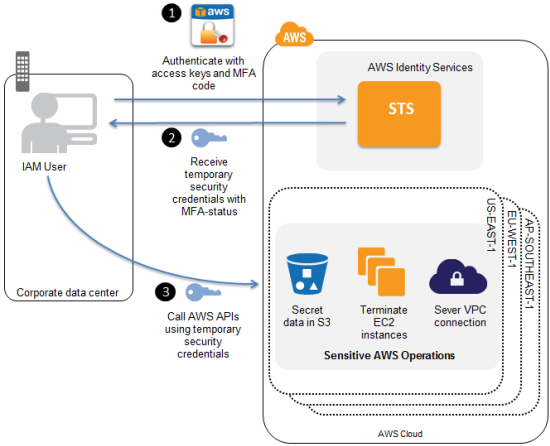 You can enforce MFA authentication for AWS service APIs via AWS Identity and Access Management (IAM) policies. This provides an extra layer of security over powerful operations that you designate, such as terminating Amazon EC2 instances or reading sensitive data stored in Amazon S3. This policy utilizes the condition key, aws:MultiFactorAuthAge, whose value indicates the number of seconds since MFA authentication. If the condition “matches”, i.e. the value of aws:MultiFactorAuthAge is less than 300 seconds at the time of the API call, then access is granted. MFA-protected API access utilizes temporary security credentials, which can be used just like long-term access keys to sign requests to AWS APIs. The process to request temporary security credentials is largely unchanged, except the user enters an MFA code into your application that requests temporary security credentials on behalf of the user. If the MFA authentication succeeds, the application receives temporary security credentials that include MFA-authenticated status. The application calls APIs on behalf of the user using the temporary security credentials acquired in Step 2. As part of the authorization process, AWS will validate the credentials and the MFA authentication. Once again, you can visit the IAM documentation to learn more. We’re always interested in hearing about your use case, so please let us know what you think!